The fruit during the fall season is just so tasty. I especially love the abundance of apples and pears. So many varieties of delicious awesomeness. Once again my husband has provided an awesome special breakfast on the weekend. Have I mentioned publicly how much I love his special breakfasts? Screw that coffee stuff, they are definitely the best part of waking up. This time my husband was inspired by another Bobby Flay throwdown loss…hehe. For the bread we just used a store brand whole wheat bread that turned out to be our best nutritional option. Check them out! You don’t have to break the bank on silly expensive bread just to eat right. Combine fruit, vanilla and sugar in a saucepan. Cook for a few minutes on medium high until tender. Allow to cool. Stir in the yogurt cheese. Combine egg whites and cinnamon in a large bowl. Heat a skillet on medium high. Dip bread in the egg mixture. Allow the bread to rest in the egg mixture for a just a few seconds to allow it to absorb the mix. Pan fry the slices of dipped bread. Once the sides are cooked top one slice with a bit of fruit filling then top with another slice. Heat for one minute and serve. Top the toast with 1 tbl of filling. Serves two. Each serving contains 304 calories, 4.3 grams of fat and 7.7 grams of fibre. Take a look at that nice fibre! We had this as a brunch so I felt full for most of the day, ended up just having an afternoon snack instead of lunch really. I was still too full! French toast for breakfast is always a total win! 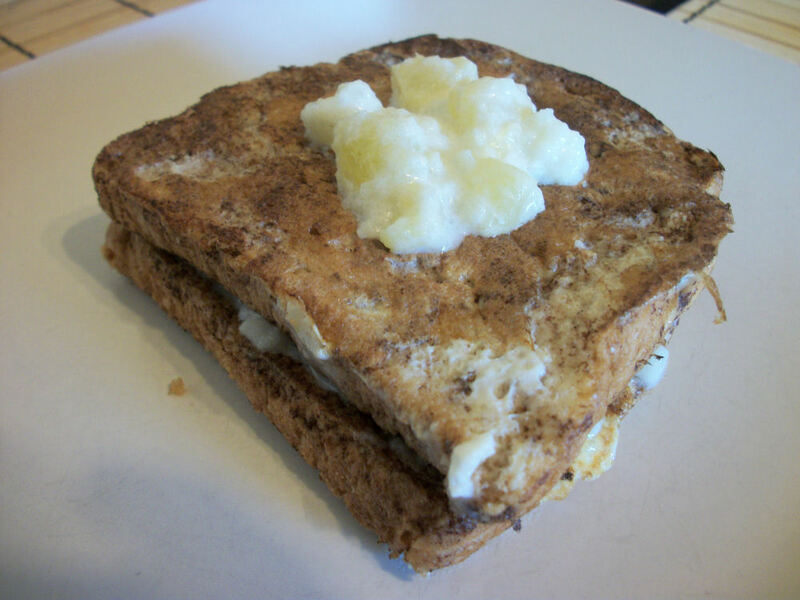 This entry was posted in Breakfast, Craving Buster and tagged apple, Bread, Cheese, Cinnamon, Egg, pear. Bookmark the permalink. Made this tonight for a Hobbit breakfast-dinner (or ‘brinner’ in Old English). It was tasty! I used hawaiian sweet bread so the toast was extra soft. Sided with bacon and mushrooms for that hobbit touch. oooo that would be delicious! I love that hawaiian sweet bread so much! I wish we could get it out here. My last taste of it was two years ago on vacation…been talking about it ever since. Hehe.